This little project took a back seat for a while … a long while ! It’s been in the back of my mind, popping up now and then to remind me that this project is alive and well. I didn’t make much progress during the past years, but this year, the blog bore fruit. I got three! hits – meaning that three distant relatives got in touch with me! Oh, how exciting! I’ve written back to them. I’ve corresponded with , and actually spoke to a great-aunt (I think shes a great-aunt – will have to check out the tree). I need to get this project back in line and organized. Some of those blanks are definitely going to be filled up. My mind was still full of the possibilities of discovering long-lost relatives and distant cousins. Discovering a town called ‘Feliciano’ – although not so uncommon to have a town bearing your name, but hey! this town is my ancestral town – can you imagine that? Its founders were my ancestors! I contacted the author of the blog, Al, who as it turned out is trying to write a history of Balete. He informed me that he was working with a Feliciano on the town council, who is probably an uncle? grand-uncle? of mine. He gave me his phone number, so I could call him and talk to him. A quick search on the internet brought up the current officials in Balete. yep, there was a ‘Feliciano’ on there. And some other surnames that I recognize from the family tree document! And suddenly, I was a little hesitant … What would he say about somebody calling from overseas, claiming to be a descendant of Mariano and Maria Feliciano? Which side of the family was he descended from? And what would we talk about, anyway? I had so many questions, and yet I didn’t have any specific questions. I thought about sitting down and forming some half-decent questions to ask, so as not to waste time and money … it was going to be an international call, after all, and I didn’t want to be saddled with a high phone bill for the month. Then I studied my family tree map and tried to figure out from his name which side of the family he came from … from Don Carlos or from Doña Florencia? haaaayyyy …. And after a little more browsing, I came across this … and recognized names from the family tree document, towns that I remember my father had mentioned. And it says that the town of Feliciano was named after Don Carlos, established in 1907. hmmm … Somehow I thought it had been established before the 1900’s. Aranas – Named after Ambrocio Aranas, popularly known as Capitan Ambrocio. Arcangel – Named after the Patron Saint, St. Rafael Arcangel. But the barrio was also popularly known as Pueahan after the Puehan River. It was established in 1917 when Balete became independent from New Washington. Calizo – Named after D. Adriano Calizo, he being the most popular and the riches man in the barrio. The barrio was established sometimes in 1917 while Balete was an arabal of the newly established town of New Washington. By that time it was scarcely populated as people prefer to reside near the Jal-o River. Cortes – Named after the Cortes family. Feliciano – Named after Carlos Feliciano, the brother of Doña Florencia Feliciano (allegedly the mistress of Fr. Vicente Guanco). It was established on 1907. Morales – Named in honor of Capitan Florentino Morales. Established in 1917. Oquendo – Named after Simeon Oquendo. It was established in 1917. This barrio served as evacuation site during the Filipino-American War. And up till now I haven’t gotten up the nerve to call … Maybe soon. 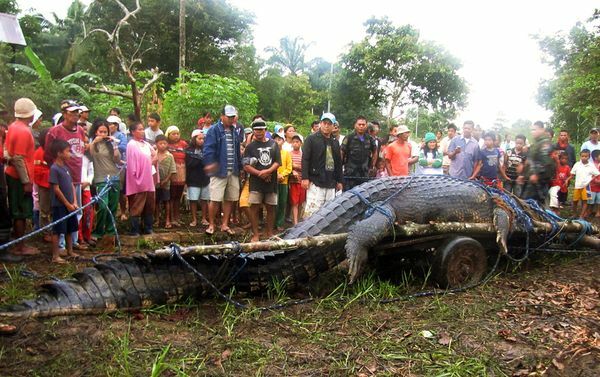 In September 2011, I came across the news article of a giant crocodile caught in the Philippines, the biggest ever caught and captured alive. And suddenly the “recollections” about Tan Anoy and Tana Bibing seemed a bit more credible. Could these be the descendants of Maêocong and Pingang Nonay, the famous crocodile couple that killed Mariano and Maria Feliciano centuries ago? With renewed interest, I went searching on the internet for the river, for the names of the pair of crocodiles … why hadn’t I done this before? And before long, I found this. ” For a time, the settlers tolerated their fear . They lived their lives by the Jal-o with that ominous awareness that they were not the masters of the river. But such fears had hounded them even in their dreams. Then came the news that a prominent couples from the poblacion was attacked by the dreaded creatures while on their way home from Batang. “Si Alo Feliciano hay ilo eot a! Si Alo Feliciano hay ilo eot a!” (Carlos Feliciano is now orphan!) came the report. Alo Feliciano was the eldest son of Mariano and Maria Bebing Feliciano, Capitan of the poblacion of the newly established pueblo of Balete (the 33rd in the Provincia de Capiz). His father was tasked to collect taxes from among the landowners (leaseholders) and remit the same to the authorities in Batang once in a month. The Jal-o was the most convenient route as horseback riding through the Cabugao trail was punishing. The occasion was grabbed as opportunity by his mother to buy household provisions which were seldom sold in Balete. On their way home as their baroto passed along the Anao swamps, a couple of crocodiles attacked their wooden craft. That fateful incident had caused their lives. This was from a blog, By the Jal-o River. Was this true, then? Urban legend? More recollections? If I went to Balete, would I see some marker in the public market, or whatever it is now? I had to know more, and contacted the author of the blog for more information. Well … the beginning of our roots, as we know it now. There was a little bit of the other side’s history mixed in, and it was a bit confusing. And is as often the case, there were inter-marriages between the same families, between cousins, cousins once and twice removed, across generations even …. It made for a good soap opera story line. So I broke down the document and mapped it out, family by family, where the information was available. The province of Aklan was broken up into townships, and as was common everywhere, the more prominent families held positions of power in the local governments, as well as their own ‘castle’ – in this case, their own town. There is a town of Feliciano, population about 2,400 (from the last census count in 2004? ), in the province of Balete. Tan Mariano (Anoy) and his wife, Tana Maria Elicerio (Bibing), had two children. A son, Don Carlos (Capitan Aló or Tan Aló), and daughter, Doña Florencia (Tana Insang). From the document, it appears that Tan Mariano held a position in the town of Balete. From what I can gather, it was similar to a tax assessor/collector. This position meant that he was travelling from one property to the next, to collect the tax payments. And it was during one of these travels that he met his demise. Wow. A famous crocodile couple killed my great-great-great-great-great-great-grandparents?! Wow. Family trees … I’d always been interested in tracing the family tree and trying to map it out. That usually meant getting the older relatives to talk about what they remember of aunts, uncles, cousins, etc. From bits and pieces of reminiscing, I had some idea of who fitted where. Unfortunately, most had the same anecdotes and recollections of the same people. Until one day while talking to my Aunt Joanna, she mentioned that her sister, Phebe, was given a document about the Feliciano family tree, when she visited the Feliciano home town, Balete, Palawan. Well, I just about jumped off my chair … and immediately asked for a copy. 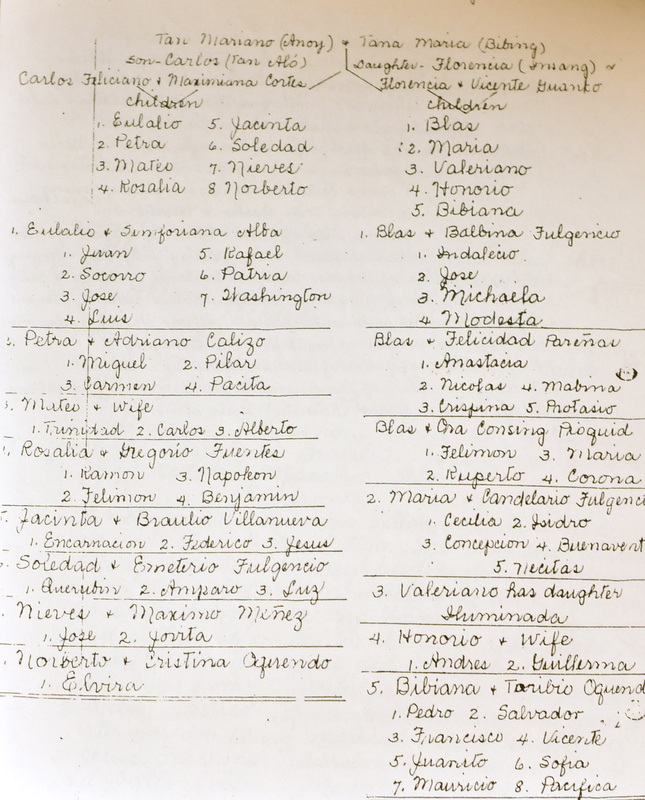 A treasure trove … ten beautiful hand-written pages of the history of the Felicianos. I think it starts from the early 1800’s – that’s something I still have to research and verify. There are some dates in the narrative, but not many. The document was written soon after 1990, which was the last year mentioned. It starts with Mariano and Maria Feliciano, and outlines through to the fourth generation descendants. There are descriptions of some of the family, their occupations, and of course, the marriages and the children. There are many names that still need filling in, but having nothing from before, this was a huge find. I started mapping out the tree, starting several versions until I found the best format, working late into the night on weekends. I filled in what I could of the fifth generation, and expanded into the current generations, which is the sixth and seventh. And the eighth generation has started.